We are Stucco Contractor in Red Deer and Central Alberta. 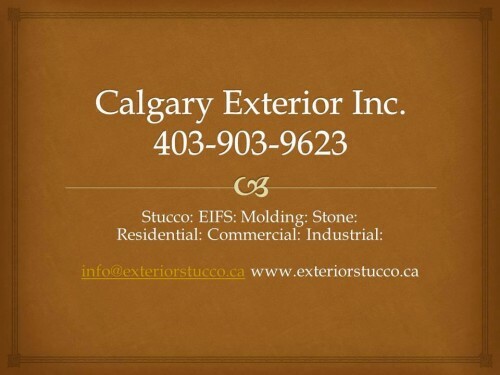 After many years we became the leading installer of Stucco, EIFS, and related products in the residential and commercial industry serving Central Alberta and other areas. Our professional approach to each project ensures that we deliver quality service to our customers at the right price. Whether it is an Insulated stucco or Non-Insulated stucco system, we have the knowledge and expertise to discuss the perfect solution for your next project. Calgary Exterior also specializes in the installation of STUCCO, an acrylic modified stucco system cement-based stucco coating that can easily transform everyday concrete into beautiful decorative faux stone finishes. We can also assist you with any of your plastering or molding needs. Do you have a large scale project that needs to be completed on-time, on-budget and to perfection?